Use a 142ml carton soured cream to fill 24 Rahms mini croustades (you'll have some cream left over). 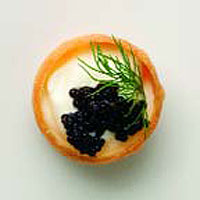 Top with Abba lumpfish caviar from a 100g jar, so it comes just above the top of each croustade. Garnish with a sprig of dill.